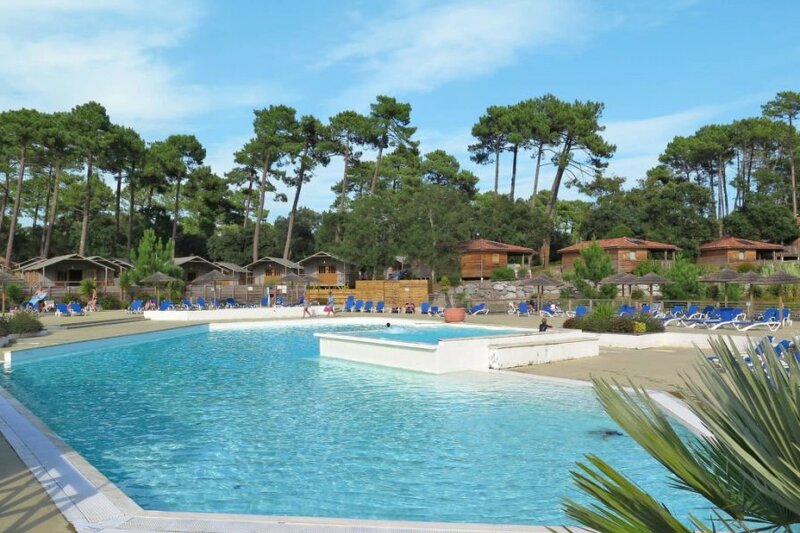 This 2 bedroom apartment with swimming pool is located in Seignosse and sleeps 5 people. It has WiFi and air conditioning. The apartment is within walking distance of a beach. Mobile home, 4 - 5 people, 3 room/s, 2 bedroom/s, 1 bathroom/s, approximately 35 m², 1 floor/s. Feature: Property on a campsite (450 units in total). Furnishing: holiday standard, pleasant, linoleum floor. Equipment: TV; internet access Wi-Fi (payment); combined heating/air conditioning. Final cleaning by tenants or against payment, € 100. Holiday resort tax. Linen/towels Bed linen available. Towels must be brought along. Towels available on loan, € 5 per person/​stay (on order). Deposit € 500 (in cash, Visacard, Mastercard). Cot/​High chair € 2 per day (on order). Pet not allowed. Internet € 19 per week per access. Situation: in the district Seignosse-Les-Bourdaines. Estate (shared use with holiday guests): approximately 13 ha, closed plot (fence, electric entrance gate with code), in a hillside, trees, pond, with garden, sand, forest. Outdoor facilities(shared use): brick barbecue. Pool (shared use): 450 m², 0.80 - 1.60 m deep, 01/05/19-30/09/19, depending on the weather, heated, children's pool. Pool area: tiled, sun loungers (depending on availability), sunshades (depending on availability), external shower. Wellness: shared use (free of charge): outdoor whirlpool. Sports facilities/ leisure time: shared use (free of charge): beach volleyball, multi-purpose sports track, bowling/boccia, crazy golf, fitness gym, table tennis table, children's playground. Shared use (payment): bikes, billiards. Entertainment: included: evening events, sport animation (approximately July/August). Day care: included: animation for children, children's club, teen's club (approximately July/August). Infrastructure: around-the-clock reception service, bakery service, breakfast service; washing machine (coin-operated); dryer (coin-operated); internet access Wi-Fi (payment) in the reception area, in the pool area, at the restaurant. Bar/cafe, restaurant, snack bar, bakery, food shop, kiosk, beverage sales. Plot description: 1 x parking in the holiday complex. Terrace (partially roofed), furnishing provided. The agent describes this apartment as an ideal holiday rental for the summer holidays. It is also good value for money. The apartment has a swimming pool and is located in Seignosse. The nearest airport is only 40km away. It is set in a very convenient location, just 0 metres away from a beach and only 750 metres away from the city center. The apartment has free wireless internet. The apartment is well equipped: it has air conditioning, a dishwasher and a washing machine. It also has a BBQ.